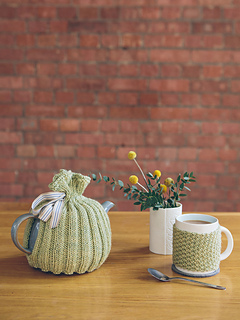 Knit this homeware teapot and mug cosy from 10 Simple Projects for Cosy Homes. A design by Sarah Hatton using our wonderfully soft machine washable worsted weight yarn, Pure Wool Worsted (wool), the teapot cosy is worked in rib and the mug cosy in moss stitch. One ball of yarn will make 1 teapot and 2-3 mug cosies.